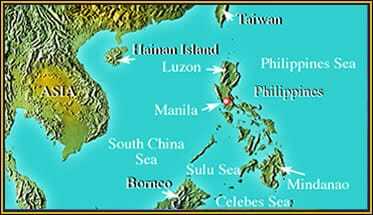 Location: The Philippines are located between Borneo and Taiwan. The flying lizards of South East Asia are small lizards with expandable lateral scaly wings known as ‘patagia’ which enable them to glide from tree to tree to escape predators. There are nine species of flying lizards in the Philippines and biologist ‘Skip’ Lazell is familiar with all of them. The northern most Philippine species of flying lizard was discovered and described by Skip from Batan in the Batanes Islands, a group of islands also known as the Typhoon Islands because of the high winds which hit them first. Mark and Skip investigate Skip’s theory that the Batan flying lizards are evolving away from flight because it is hazardous for them to glide in the strong winds which could rip their patagia, smash them into trees or take them out to sea. Skip and Mark also plan to visit remote island of Itbayat, even further to the north, to see if any more flightless flying lizards live there, but reaching Itbayat is a challenge in itself. Mark is also keen to seek out the endemic McGregor’s pitviper found only in Batan’s rainforests. This small, brightly coloured snake is poorly known and only found on this single small island, one of several such Batan endemics. 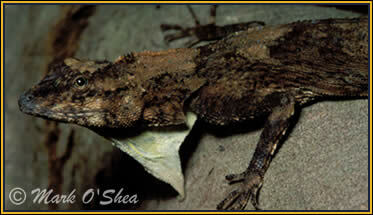 This male Batan flying lizard (Draco jarecki) may be evolving away from flight.